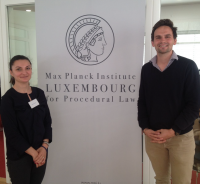 Alexandre Biard (ERC postdoc) and Alina Ontanu participated in the 3rd IAPL-MPI Summer School entitled Privatizing Dispute Resolution and Its Limits that took place from July 1-4 in Luxembourg. Alexandre presented evidence that he collected on the impact of the Consumer ADR Directive on the quality of ADR entities in several EU Member States. Alina pleaded for a more comprehensive framework covering both court and out-of-court procedures so as to facilitate consumers’ access to justice in cross-border litigation. Presentations were followed by fruitful discussions with participants coming from all over the world. A book including all contributions will be published in early 2019.